Last week I posted an 1860s seaside frock in one of my (many) favourite colour combinations: white, yellow and aqua. Alas, the colours, combined with the waistless bodice (so characteristic of 1860s outerwear, but so anathemic to modern aesthetics) elaborate scallops, and long tails with pom-poms had you calling ‘circus marquee’. The circus left town with a disappointing 5.8 out of 10. Intriguingly, of all the votes, only one of you gave it a x.5 score – I guess you all had solid feelings about it! Today’s Rate the Dress has a twist. I’m not just showing you a dress to rate: I’m showing you two dresses with the same theme, by the same designer, but with quite different silhouettes, for a Rate the Dress-Off. You’ll rate both dresses, and we’ll see how the overall look comes off, plus which dress you prefer. Then a full skirted sun-frock, with exactly the same bodice, but a gathered dirndle skirt instead of a pencil skirt, and a blue skirt border instead of pockets. 4 for the first, 8 for the second. The first looks like some weird nurse frock the second looks like an adorable party dress. Hmmm…this is hard because I love all things nautical! I’m going with 9 for the first dress. The slender silhouette reminds me of great 30s nautical dresses and I love the hip pockets! I’m giving the second dress a 8. 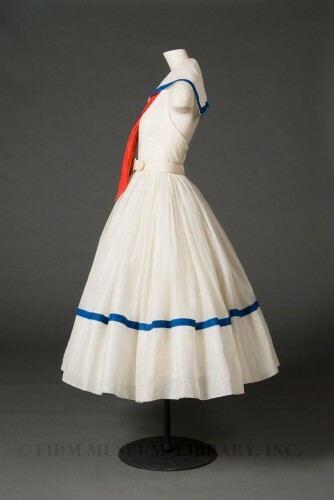 I still like it a lot but the full skirt plus the nautical theme plus the white looks a bit like a little girls dress. I think if the blue and white had been reversed, it would have looked more mature. Both dresses lose points for the low back. Being a girl who can’t go bra-less, I’m not a fan of dresses where you need to be bra-less. Long-time reader, first-time voter! I’m excited! Let’s see: I like them both, but in very different ways. The first has a severity and an ugly-chic vibe that reminds me of the 1970s thrift-store dresses my hipster friends wear. The second feels a lot happier and more feminine and simply pretty. I’d give the first a 7 and the second a 9. For some odd reason, I actually like the slim skirted one better! Maybe it’s just the mannequin they put the full skirted one on…hmmm. and 9.5 out of 10 for the full skirted, just because I like them both so much! Unfortunately I don’t take votes on smaller fractions than .5 – just too much work for me to add up! I’m rounding your first vote up. I like them both (I like clean sailor looks, and who can go wrong with white trimmed with navy and red? ), but I really, really love the narrow skirted dress. The front view is truly elegant, and the bit of bare back beneath the sailor collar makes it just a bit edgy. I’d wear it in a heartbeat (assuming the designer was able to properly accommodate my hips and thighs!). The full skirted dress is fine, but looks just a bit boring and girlish by comparison. The narrow-skirted dress: 10 of 10. The full-skirted dress: 9 of 10. I think the full-skirted one isn’t fairly represented on the mannequin, because the full width of the collar is hidden by the shoulders. Whereas on the first one the collar is visible from the front. That makes the full-skirted one look out of balance. I love full skirts, but as a pear/hourglass, I’m keenly aware of the important of balancing the top half. That’s what throws the look for me for the second. And it somehow does look too girly and insipid! I’d like it better with a full circle or gored skirt instead of the gathers, and petticoats that are full at the hem instead of the hips. It looks too puffy, fighting the sharp lines and angles of the bodice. I’d give the first a 9 and the second a 7. I love the white with blue; the proportions are really good. Both lose points for the low back. I’m with Stephanie – no fair to those who can’t skip the bra! The second loses more for having a gathered skirt instead of a smooth waist. Oh, this is difficult! I like them both for two different reasons. I like the nautical theme like most of the other people, and the two different versions are very interesting! I think I’ll have to give this one to the first version though (well, I suppose it’s actually the later version, since it was made three years after the other). I love full skirts, but the one on the bottom dress is just too long. Unless the woman who owned it had Giant Amazonian Legs (hey, look, I can make an acronym! They’re GALS! ), it would engulf her! I would have a much more difficult time had the bottom dress been hemmed up closer to the ribbon. So, anyway, nine for the top, and eight for the bottom. The first one is a bit cartoonish – fabulous, but cartoonish. I do find them both a bit animé actually. The first one is a bit burlesque pin-up girl, the second one is hyper-cutesy and even a bit twee, to the extent where it almost feels like a woman wearing this would run the risk of looking like she wanted people to think she was still a cute little girlie girl – it’s totally asexual, whereas the first one goes a bit too far in the other way, but actually has more attitude which gets points from me. The first one: 8/10, for attitude and being slightly subversive, and managing to tip a saucy wink and a sashay with it too. I love the shape and the crispness of the detailing with the crisp silhouette and the vibrancy of the scarlet scarf. The second one: 4/10 for being a walking cliché of bland “Mummy picked out this dress. Isn’t it pretty?” insipidity. Cute, but you’d need a lot of attitude to pull off being dressed like a female Donald Duck – I love a cartoony frock, but this is just so archetypal cartoon sailor dress that it looks like it would wear most people rather than being worn by them. Sorry, but I think it’s a bit boring. I have seen a photo of a relative in her pioneer uniform and yes, it does look like that. Too much like a nurse in a creepy old fashioned film. The full-skirted frock is much softer and prettier but still an adult would look a bit silly in it…too girly. Fine for a young teenager in the 50’s. A VERY rich young teenage girl! This is designer fashion after all! Definitely prefer the first one. I’m normally not a fan of the sailor collar but with the halter back it’s really cool . But as much as I like a full skirt, and I do, there’s something about the skirt on the second one that is just wrong. The pencil skirt on the first is sleek and lovely though. So 8 for straight skirt, 6 for full skirt. If the first dress had no pockets and had the blue trim at the bottom of the skirt it would be perfect. But I am not a fan of the size of the pockets or their placement… even on the mannequin it is not very flattering. With the second dress, I like the blue trim on the skirt, but I don’t think such a full skirt would be practical on a boat. I don’t know why but it doesn’t seem to go well with the nautical theme. The rest of it I love though. If we could mash them together… it would be a ten. 10/10 for the sheath dress. It’s beautiful and innovative. 3/10 for the second dress. That one is ugly. It’s insipid, dull, and looks like it was intended for a small child. It would be fine as a child’s dress, but as an adult’s dress it’s just a bad idea. Omg I have been in love with that full skirt version for years!!!! I’ve always wanted to recreate it! So that is absolutely a 10/10 for me! I like the fuller skirt of the 2nd dress. The first one looks more grown-up. Love it! I give it a 8.5/10. The second one looks like it’s a junior/teen. Really sweet. I give it a 8/10. The contrast blue is lovely. Eight for the slim dress – very smart. Seven for the full skirt – sweet, and nicely full, but looks a bit as if the wearer is auditioning for ‘HMS Pinafore’! I found myself singing the song as I looked at it. 10 out of 10 for both of them!! I like this idea of a dress off. My favourite is the second full skirted dress. If the theme is nautical then one simply must have room to stretch the legs when boarding a yacht otherwise there is the risk of splitting the seams. Not keen on the collars on either frock however. Not a flattering style for my shape so I give the first dress 7 out of 10 and the second frock 9 out of 10. These are both lovely. I’d say 6 for the first, 8 for the second. I just like that fluffy skirt. I feel like the mannequin the first is on doesn’t do it much justice though, it’s a bit too small for the dress and no one’s taken the time to tie that red scarf properly. 8/10 for the first more fitted look. I think it would be a lot more practical for the seaside than the second one. 6/10 for the second. That’s a lot of skirt! It’s cute, but I prefer the look and style of the first one. I love them both, but if I were going to wear one, it would have to be the first one. The second would look like I was trying to dress to match my daughter if I were to wear it. 10/10 for the first one 8/10 for the second. I love the colours used, but I’m more of a poofy dress girl. I love both of them! At first glance, I like the slim-skirted one better; I don’t like the full-skirted one that much from the front (but I suspect that’s because of the mannequin). On second glance, they are about equal. The first one looks more modern (I especially like the blue trim on the pocket edges); the second looks more stereotypically 1950’s. 10/10 for the first; 9.5/10 for the second. The first is super hot, a 9 and the second is super cute, a 9. 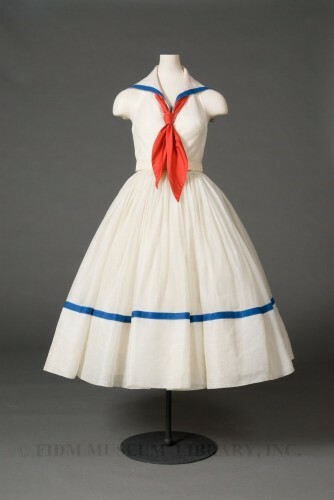 I have a small collection of vintage sailor dresses and would pick number 1 in a heartbeat. Although slightly uniform-ish front on, the cutaway back is killer. 8.5/10. The second dress just doesn’t seem balanced to me, I don’t think it’s just the mannequin, but the placement of the blue band around the skirt bothers me – I would either have it right along the hem to match the placement of the trim on the collar, or have a second band beneath it running along the hemline. Cute, sure, but too little-girl-dress-up for a woman to wear with any degree of dignity. 6/10 for number 2. Aaack! Kinda hard to decide…they are both very nice dresses! I think the shift dress would be more practical for going out to the beach but the romantic in me simply loves the full skirt on the other dress. So…I would have to say I prefer the second (full skirt) dress! But I will have to dock a point or so because I don’t like open backs (but that’s just me). This is tough. I’d probably give both of the dresses an 8, but for different reasons. I love the second, full-skirted one, and could see myself wearing it (I love full skirts!). However, I think the slim-skirted one has an overall better design esthetic. I think the slim skirt works nicely with the wide collar and would look quite nice on someone a little curvy. I love a nice dirndl skirt – 9/10 for the fuller dirndl skirt version. Both are super cute dresses, though. I love the open back and nautical theme for both. No vote for the slim dress? Without it, I can’t count yours. Shoot, just saw this – Slim dress is a 7/10. Hmm, interesting. I love fifties full-skirted dresses, so the second one should walk it for me. But I definitely prefer the first, straight dress. Can’t quite put my finger on it, but there’s something about the second one which doesn’t feel right. It’s very hard for me to not give aything by Norell an automatic 10. However, the first one seems much more like a real Norell, and the second onee–not quite so much. I’m not quite sure why, but it just doesn’t. So 10/10 for the first, and 9/10 for the second. Hm, I agree with the commenter above who said the second dress would wind up wearing anyone who put it on. To me, it looks a bit costumey, like the person who wore it was playing a role in her own life, in this case the role of “pretty dolly housewife”. The whole thing would work much better with a circle skirt, I think. 6. The first one is delightful. Perhaps it’s for someone playing a role, too, but I just like the role better? At any rate, 8. 8/10 for both from me. They both demonstrate the beauty in simplicity and colour that are what’s so great about nautical fashions. The two points off are a) for the danger of bagginess/squareness in the first one, b) the fact that yes, a smooth circle skirt would look better on the second one. Both those things are rather major, hence two points off… but I really can’t say that I like either of them more than the other. Love the shift dress. Any silhouette in a pencil skirt is timelessly classic. While I love the full skirted version my opinion is that the shift style will remain on trend as long as style remains liberating.